Is there a way to remove the BUY PHOTOS button from the top right of every gallery page? Doesn't seem to matter which gallery style I use it's always there and I find it a bit offputting for visitors. 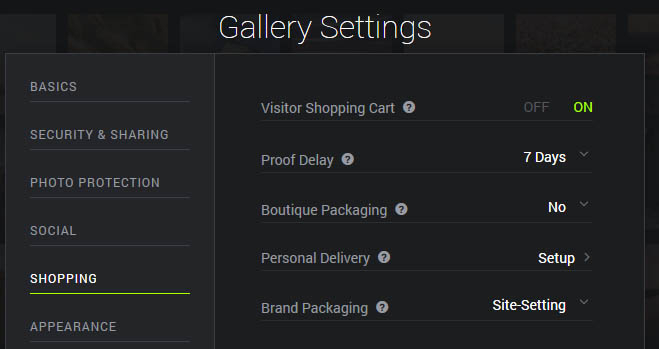 Customize > Gallery Settings > Visitor Shopping Cart > "OFF". Note that when you are logged into your account the Buy button will still show. Thanks but that's not what I'm after. If I use the smugmug style with thumbs on the left and a larger image on the right, above the image on the right is a 'play' button and 'buy photos' button. It is this 'buy photos' button I want to remove, not every 'buy' button eg when someone clicks an image I want there to be a 'buy' button. I see now (I think). You just want to remove it from the gallery section, but displayed on the single view. Either add this to your Theme's Custom CSS Section or a CSS block on "All Galleries". To add, if this doesn't work, please post your site. Winner winner chicken dinner! Thanks a lot Mike.